These are, then, not really theories, but rather themselves unconscious structures and so many afterimages and secondary effects of some properly postmodern cognitive mapping, whose indispensable media term now passes itself off as this or that philosophical reflection on language, communication, and the media, rather than the manipulation of its figure (2009: 417). He highlights the problem at its most fundamental level: if the system itself does not change, then all we are able to do is contemplate it within its system of effects (and with the tools) it produces. This is not a new problem for theory – the inside/outside dichotomy of language – but, it does leave us with the perennial problem of where to go. 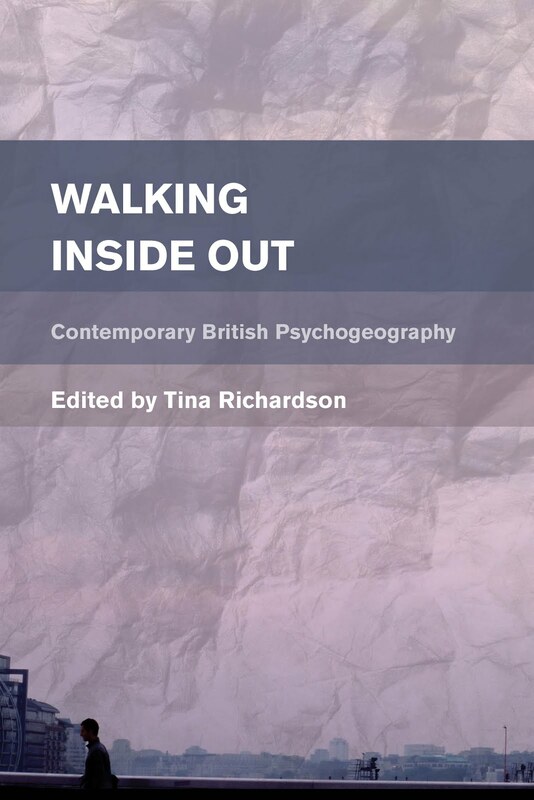 The concepts highlighted above – such as the need for tools to navigate the environment, and the materiality of space and its system of effects – lend themselves to discussion within the field of psychogeography and under the umbrella of cognitive maps, also. Roger M. Downs and David Stea’s Maps in Minds: Reflections on Cognitive Mapping (1977) is an extensive geo-psychological study of cognitive mapping, although it does not deal with mental and physical space in any political sense. It offers a concise study of psychogeographical cognitive effects and provides definitions of cognitive mapping: “Cognitive mapping is an abstraction covering those cognitive or mental abilities that enable us to collect, organize, store, recall and manipulate information about the spatial environment” (1977: 6). They explain that cognitive maps are not just visual images contained in our minds but are also connected to our other senses (1977: 23). While they acknowledge ‘the social’ as one part of what influences our cognitive maps, they do not deal with the complexities of postmodernity as it pertains to culture and/or capitalism. However, since their text was published in 1977, it may have been too early to take a retroactive position on postmodern space. In his essay ‘Cognitive Mapping the Dispersed City’, Stephen Cairns cites Kevin Lynch’s The Image of the City as his own influence. While Lynch provides an analysis by form – looking at various urban elements such as paths, landmarks and edges – he adopts a post-war narrative, the book being written in 1960. Cairns’s critique is in the way that Lynch’s cognitive mapping may be further used to decentre the subject in the form of how they appear as “‘the user’, ‘the community’ and ‘the people’” (2006: 193). This could be seen as both positive and negative, depending on differing perspectives attached to ‘where you stand’. Decentring is considered a common position for the individual to take up in the postmodern text (such as in deconstruction). When that text is the city landscape, this may enable an opening up of other views of the city, such as its edgelands. It encourages differing perspectives with regard to a sense of place. However, the concept of decentring may be considered as a devaluing of the citizen in the centre of public life (as it pertains to the city as civic centre). Cairns is concerned with what is not representable in and of the city. Citing Harvey, Jameson, Baudrillard and Debord, he discusses the material reality of the city with its postmodern problems of wayfinding, while seeking out its ‘blind spots’ in an attempt to answer some questions about cognitive mapping. These “blind spots” appear on “a refined spectrum between social space and architectural space such that conventional representational logics simply cannot register them” (2006: 203). Cairns, Stephen. 2006. ‘Cognitive Mapping the Dispersed City’, in Christoph Lindner (ed. ), Urban Space and Cityscapes: Perspectives From Modern and Contemporary Culture (London and New York: Routledge), pp. 192-205. Downs, Roger M. and David Stea. 1977. 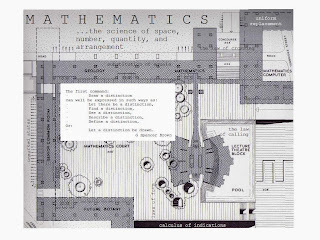 Maps in Minds: Reflections on Cognitive Mapping (London and New York: Harper and Row). 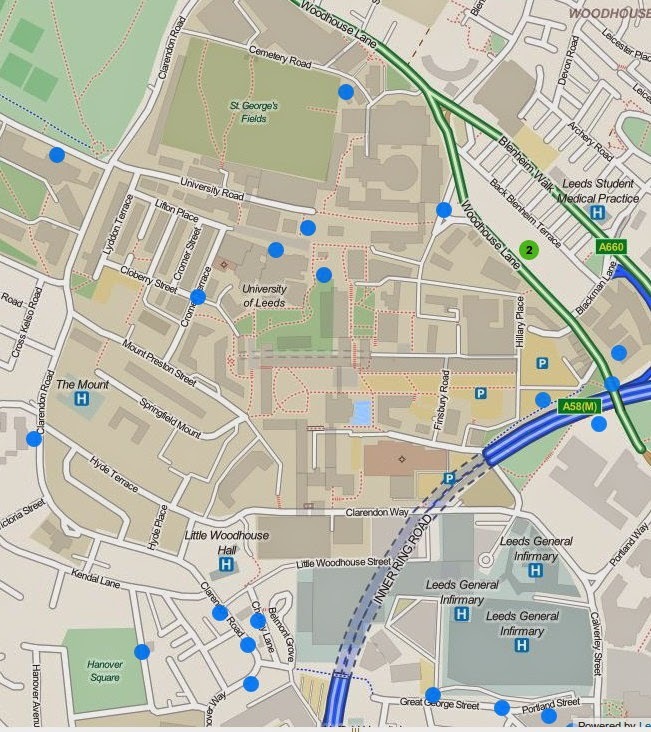 The following map shows the GPS trails of people who have walked around the University of Leeds campus area and have then loaded their data onto OpenStreetMap. OpenStreetMap is open source software by the OpenStreetMap Foundation and is a collaboration by its contributors providing free geographical data and mapping. Anyone can contribute by signing-up online. 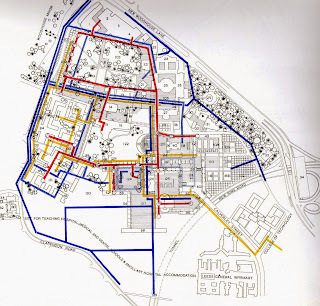 The data shown in the map below shows the walks made by people walking around campus while at the same time logging their route using GPS software on their smartphone. They have subsequently loaded this information onto OpenStreetMap. Some of the data on this map goes back to the campus dérives I did with Leeds Psychogeography Group in 2009 and our walks actually appear within the consolidation of trails you can see on this map. These lines are made up of tiny dots which are overlaid in places. 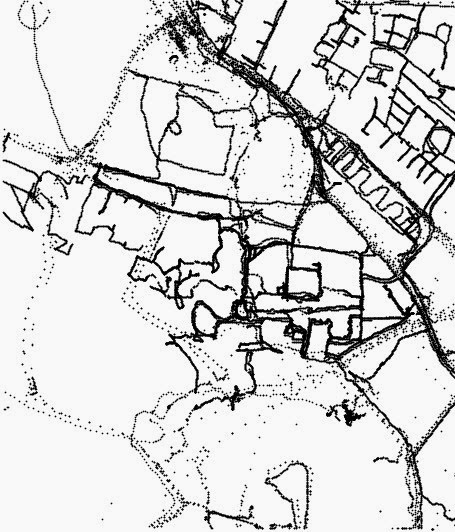 The dots make up a trail by an individual, which can be seen when zooming into the map online. Each dot represents the moment when the GPS picked up a signal of that individual’s location. The darker the line, the more people have carried out this process while walking that particular route. Speed is indicated by a greater gap between dots. Pauses appear as a density of dots. The GPS device might indicate a route taken on a cycle or, also, in a car. What is interesting about the above map is that no map outline is included in the image, nevertheless the outline of the campus appears in the accumulation of dots, as you can see by looking at this map which is taken from the Chamberlin, Powel and Bon Development Plan. This map (and the previous one on Blue Plaques) show the infinite possibility for cartographies to become ways of presenting personal and qualitative information while also handing over a degree of control of the mapping process and end result to the user/cartographer. The open source software that is often used for these types of collaborations also, to a large extent, disengages it from capitalist production and, hence, provides much more freedom of expression, production and distribution. Blue Plaques are signs that are placed on places of historical interest and are administered by English Heritage. This map shows those Blue Plaques on the University of Leeds campus and in the surrounding area: for example, there is one dedicated to Clifford Allbutt who was a physician at the Medical School in Leeds and invented the first compact medical thermometer. There is also one on the Students’ Union for the band The Who, who played in the Refectory in February 1970. The gig spawned their famous album Live at Leeds. These types of maps can be made for one’s own use by utilising open source software, such as, in this case, Open Plaques. Data can be filtered and the map scaled to fit one’s criteria. Many of the images that can be produced from open source software are often Collective Commons (CC) attributed, which provides much more freedom than a regular copyright.